Getting into 3D printing can be pretty difficult. There are all kinds of products to choose from and everyone has their own preferences. As a result, any information you’ll find tends to be highly subjective. 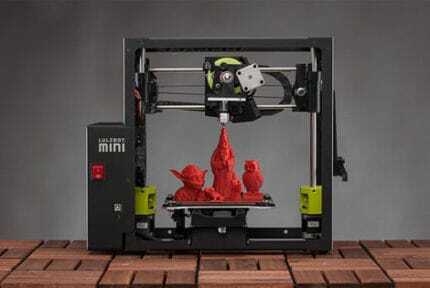 Once you’ve purchased and set up your 3D printer, you’ll have to decide which kind of materials to use. 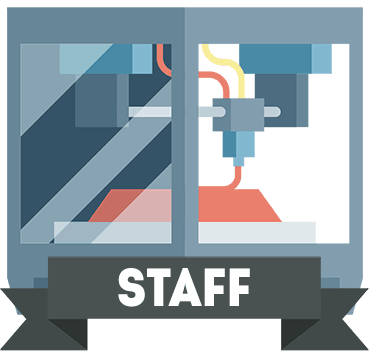 Here, we’ve created a wholly factual, objective description of some of the most commonly used 3D printing materials. 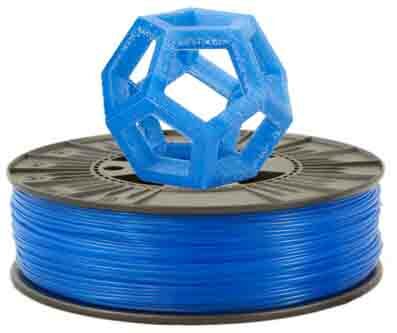 One of the most-used printing materials, PLA (Poly-Lactic Acid) is highly versatile. It’s made from renewable sources like sugar cane, which helps keep the price low. It’s a very forgiving material with a low chance of warping and good reusability. As a bonus, it produces a sweet, popcorn-like smell when melted. Because of this material’s low melting point (around 150°F), it’s unsuitable for high heat work. Additionally, while it’s very versatile, the final products tend to be quite brittle, so if you’re building something that’s going to take a few hits, you might want to consider using something else instead. ABS (Acrylonitrile Butadiene Styrene) is the second main plastic used in 3D printing. It’s more heat-resistant than PLA, but can be melted down and reused if needed. Its melting point is at about 221°F, so you don’t have to worry about your creations melting in most cases. 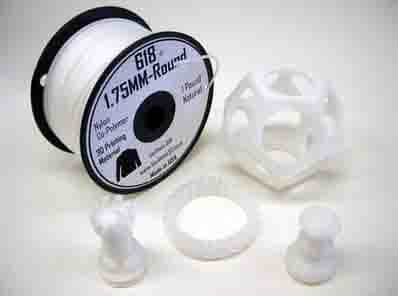 This is a more durable plastic too, making it a strong choice for prototyping. You can sand, paint, and polish it without worrying about cracking or warping. It barely shrinks too, so you don’t have to compensate too heavily for that. For the reasons above, ABS is heavily used in manufacturing: it’s what LEGO bricks are made of! HIPS (High Impact Polystyrene) is a rigid, inflexible printing material, often used to create support structures for larger models. It’s water-resistant but can be dissolved in d-Limonene, which prevents the notches left from snap-off supports. It’s a nice, lightweight plastic, which is why it’s usually used for replaceable parts. Now, there are a couple of limitations. First of all, you’ll need a heated printing bed so that it doesn’t stick. Second, you’ll need a well-ventilated printing area. This is because HIPS fumes can give you a real headache if they’re allowed to build up. With a transition temperature of 212°F, it’s very similar to ABS. 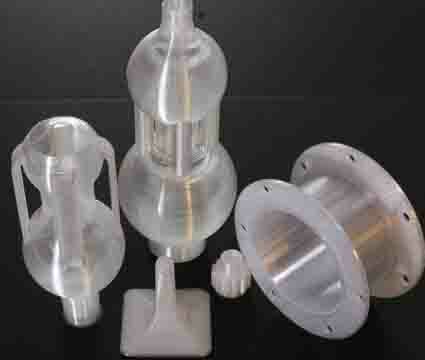 Like HIPS, PVA (Polyvinyl Alcohol) is most commonly used as a support material. 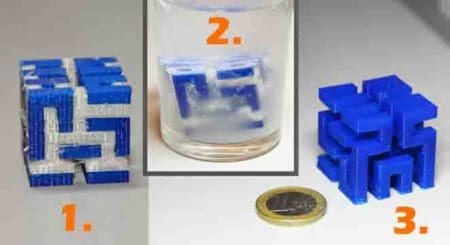 It’s not great for creating objects since it’s soft and biodegradable. The main difference between PVA and HIPS is that PVA dissolves completely in warm water. This means that you don’t need to buy any extra solutions or products and can just get on with the job at hand. The main downside of this material is that it has a tendency to clog your nozzle if you keep heating it without actually printing. Also, you’ll have to store any extra PVA in an airtight container to prevent any moisture getting in. If you want to create objects that can take a beating, nylon is the right material for you. It’s tough, abrasion-resistant, and has a good degree of flexibility to it that most others don’t. For instance, nylon can be used to create cable ties without them snapping. The main issue is that nylon has a tendency to absorb moisture from its surroundings. This can warp the finished product and compromise its structural integrity. As such, you’ll have to store it in an air-tight container when not in use. Also, its transition temperature is pretty high, at around 250°F, so you might need a special extruder. 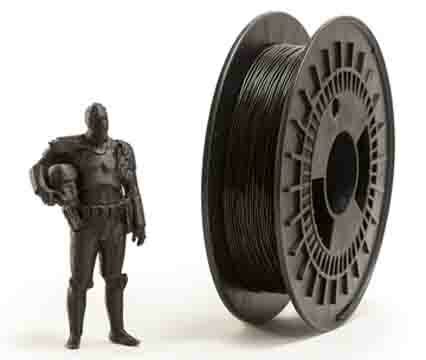 Carbon fiber filament is usually PLA or ABS infused with tough fibers that enhance its stability. It’s very light, yet manages to vastly improve the stiffness and rigidity of an object. Further, these fibers help to prevent shrinking as the item cools. 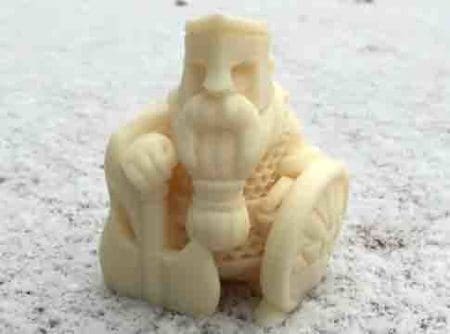 The required printing settings barely differ from those of ABS or PLA filament. There’s a catch, though: carbon fiber filament makes brittle prints and tends to clog easily, and the fibers can scratch your nozzle, changing the way it prints. For this reason, you’ll need to invest in a stronger, ideally steel nozzle before using carbon fiber. Polycarbonate filament (sometimes called PC) is a transparent, tough material that’s suitable for high-temperature applications thanks to its very high transition temperature (around 302°F). PC is naturally flexible, so it can be used in a huge array of circumstances, including those where the print will be subject to stress. However, PC filament absorbs moisture from its surroundings. This can cause warping or even layer separation in some cases, so you’ll want to store it in an air-tight container wherever possible. 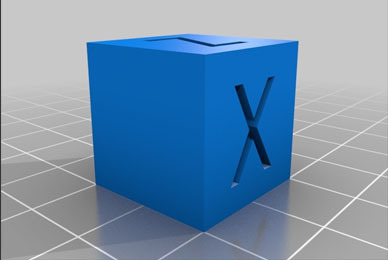 Because of the high temperatures involved, you’ll also need some form of heat protection when printing models with it. ASA stands for Acrylic Styrene Acrylonitrile. It’s commonly used in outdoor applications because it’s highly resistant to high temperatures and UV rays. It’s tough too, so you don’t have to worry about it shattering unless you’re really rough with it. So far, so good, but what’s the catch? Well, ASA is pricey. Also, it gives off fumes that can be hazardous to your health. We’d recommend opening all the windows in your printing room, and perhaps even wearing a mask, just to be safe. With a transition temperature of around 210°F, you’ll also need to run your extruder pretty hot. 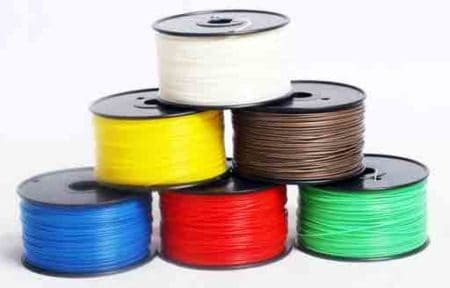 There are as many different filaments as there are printers, and it’s not always easy to keep up to date with recently released materials. However, we hope that this guide has shed a little light on all the products that are available and given you some ideas for your next prints.